This article presents a short BGP (Border Gateway Protocol) lab on Cisco routers. Many of you have heard what the BGP is, but not everyone had the opportunity to try out the protocol. This lab will be especially interesting for those, who have not had the chance to see this protocol in action. This article contains little theory, which is why for those who have never heard about BGP it is recommended to visit this page, this, or this one. In order to run the lab it is recommended to use GNS3, a great simulator that can be easily found online. The goal is to make the connection between routers A and C primary for incoming and outgoing traffic, while the connection between B and D a backup one, used only when the primary connection fails. The rest of the interfaces must be setup independently in a similar manner. Each BGP router must have an AS number (according to the topology) that specifies which AS the router belongs to. Additionally, each BGP router will serve two sessions: one iBGP session with the router in the same AS to operate within an autonomous system, and one eBGP with a router located in another AS to operate between autonomous systems. Sessions must be configured on both sides of the connection. The configuration of the rest of the routers remains an independent task. The next thing to do – is to use a non-standard mechanism, proposed by Cisco, next-hop-self. Essentially, it allows you to change the Next_Hop address before advertising the route to another BGP router in the same AS. The BGP router changes the value Next_Hop attribute to its own address. Because of this, intra-domain routing in each AS does not need to be configured. This mechanism has to be configured only between routers in the same AS. Configuration of the other routers remains a separate task. The address space used in AS 65500 is 110.0.0.0/24. In order to simulate a network like that, connected to the router, one can configure a loopback interface on BGP router B. Then, the routers must advertise the subnet to which they have access. BGP router B advertises 110.0.0.0 network with 255.255.255.0 mask, which is on the Loopback 0 interface. Routers C and D will announce only the default route to A and B (the route that will be used for all outgoing traffic from AS 65500). Attribute Local Preference can be used in case the goal is to make routers A and B use only the primary link for the outbound traffic. The attribute has a value of 100 by default. The value of Local Preference is exchanged between all the routers located in an AS. The higher the attribute value, the higher the priority of the connection. Changing the Local Preference value can be achieved by using a Route Map. 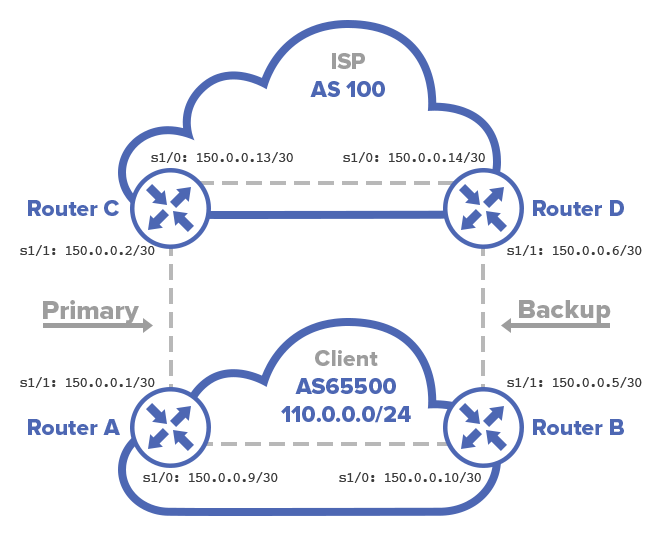 In order for Local Preference changes to take effect, the previous BGP session settings must be reset. Traceroute can be used to check whether the configuration is correct and to enjoy the result, by turning off and on certain interfaces, simulating a link fail. In case the goal is to ensure that the routers C and D route all their traffic via the primary connection, MED attribute can be used to accomplish this task. The main link should get a lower value (in this case MED 20) than the backup (MED 30). This can be done using a Route Map. The same procedure must be accomplished on BGP router B with the value of MED 30. It is essential to reset BGP session on the ISP routers, so that new metrics values can be obtained.